Business After Hours – Networking at its best! Join Coldwell Banker Premier as they host the Front Royal/Warren County Chamber of Commerce Business After Hours on Tuesday, April 23rd from 5:30-7 pm. located at 415 C South Street in the Royal Plaza Shopping Center. Since 1906, the Coldwell Banker® organization has been a premier provider of full-service residential and commercial real estate brokerage services. Coldwell Banker Real Estate is the oldest national real estate brand and franchiser in the United States and today. It has a global network of 3,000+ independently owned and operated franchised broker offices in 46 countries and territories with more than 92,000+ affiliated sales professionals. Our industry-leading tools and services have helped make the dream of owning a home a reality for millions of families. Our local Coldwell Banker Premier office has been in Front Royal since 1995. Voted #1 in 2019. This year we are celebrating 24 years of servicing the local market. Our Front Royal office agents alone offers over 250 years of experience. We are ready to serve their clients and community. Business After Hours offer attendees a relaxed but purposeful networking atmosphere, capped off with some great drawings and giveaways. Spend some time catching up with friends, making new business contacts, enjoying refreshments and of course NETWORKING! Business After Hours is the Chamber’s longest running and most popular networking event. RSVP here. Are you newly engaged? Congratulations! Join us for the Vows in the Valley Bridal Show on Sunday, March 31st at Shenandoah Valley Golf Club from Noon-3 p.m. Stroll the ball room visiting exhibitors offering a variety of options for your big day. From planners, to bakers, to florists, and so much more, you’ll find a good variety to help complete your planning. Fashion show with She Said Yes Consignment begins at 1:30 p.m. Raffle drawings and prizes all day long. The first 50 brides to register will receive a gift bag. Register here. Visit our Facebook event for a updated list of participating vendors. Spring is right around the corner and it’s time for an update! 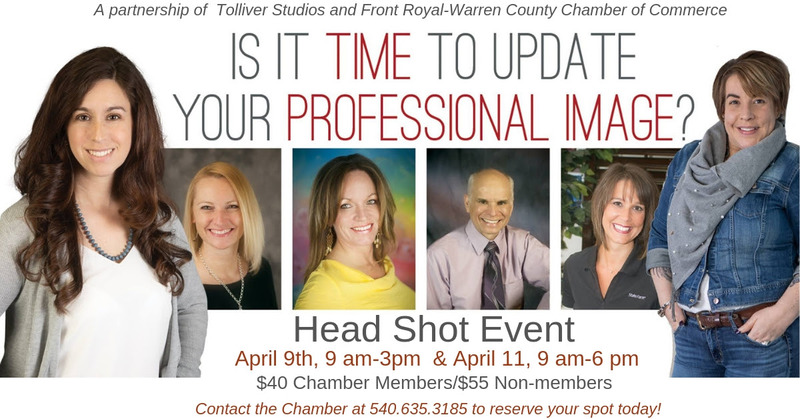 The Chamber has partnered withTolliver Studios to update your professional head shot. Cost is $40/Chamber members and $55/Non-members. You will receive one digital image of your choice. Additional images available through Tolliver Studios. Appointments available every 15 minutes. Contact the Chamber 540.635.3185 to reserve your spot today. Payment must be received in advance of the event. Looking for Employees?? 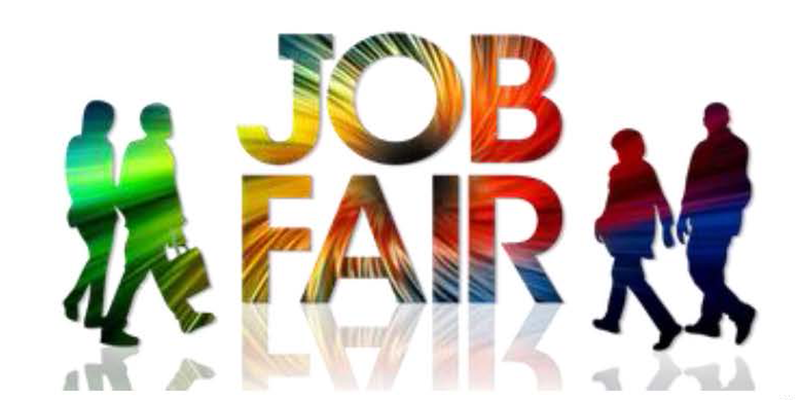 The Chamber’s Small Business Committee is hosting a Job Fair on Tuesday, April 16th from Noon – 3 p.m. at Samuels Public Library. Information for employers wishing to participate can be found here. Join us for our very own St. Patrick’s Day celebration at Royal Family Bowling Center as we Strike Up Some Fun on March 14th! Space is limited – get info here. If weddings are a part of your business, then your business needs to be a part of the 2019 Vows In The Valley Bridal Showcase At the Vows in the Valley Bridal Showcase, you will be directly in touch with many brides. You can display your products for them to see, taste and/or experience. Your booth will allow you to set an atmosphere for on-the-spot consultations and planning. The Vows in The Valley is where you and your business need to be. Interested in being a vendor? Get info here. Are you a bride? Register to attend here. Join us on Tuesday, January 22nd @ 5:30 pm for our first fantastic networking event of the 2019! Business After Hours offer attendees a relaxed but purposeful networking atmosphere, capped off with some great drawings and giveaways. Spend some time catching up with friends, making new business contacts, enjoying refreshments and of course NETWORKING! Business After Hours is the Chamber’s longest running and most popular networking event. At Fox Trail Senior & Memory Care Living of Front Royal we are committed to providing the highest level of well-rounded care with skill, compassion, and dignity. Our community provides and intimate, homelike setting, with a maximum of 23 residents. The size of our community allows our care partners to focus on the residents’ specific needs and allows us to ensure that each resident receives the highest quality of individualized care. Staff members are on duty 24 hours a day, seven days a week. Our program is tailored to the individual, promoting choice, personal preferences, and overall well-being. Our reputation for excellence and quality is supported by strong values and an experienced staff. Recruited with our independent seniors in mind, our team members are devoted to providing well-rounded care with skill, compassion, and dignity. We are proud to offer a multi-faceted Activity Program here within our community. Activities include, but are not limited to, weekly pet therapy sessions, daily devotionals and a weekly church service, weekly art therapy sessions, musical entertainment, inter-generational activities with local students and civic organizations, and daily exercises for both the brain and physical body. Each resident’s Activity Program is tailored to meet their specific needs. Fox Trail Senior & Memory Care Living ~ Just Like Home. Bring your lunch and join us at the Chamber on Wednesday, January 16th at 11:30 am for Pod – WHAT? What’s a Podcast – Who Listens – And Why Should My Business Care? with Janet Michael, owner of Java Media & host of The Valley Today on The River 95.3. Janet has an extensive background helping small businesses grow using social media & digital marketing. She’s an avid podcast listener and has produced several for both fun and marketing purposes. Podcasts have been around since the late 1990’s, but in the age of on-demand TV & movies, they have exploded in popularity in the last 5-10 years. In this session, we’ll learn about what a podcast is, who listens to them and why. Podcasts are entertaining, they’re educational, and they’re a great marketing tool. Janet will share a few of her favorite podcasts and we’ll talk about how to listen – whether it’s on your phone or a computer – and even subscribe you to a few podcasts to get you started. So, bring your phone, bring your questions and bring your best radio voice because who knows, we might just record a podcast during the session! RSVP here.